Back in the days of Windows XP, Microsoft released a security patch that makes it impossible to view CHM files that are stored on a network drive (as opposed to CHM files stored on your own computer). The help file will appear, but instead of the topic text you will see an error message "this page cannot be displayed". This restriction also affects Windows Vista and later, including Windows 10. If this registry subkey does not exist, create it. This works on Windows XP and Windows Vista. It used to work on Windows 7 and later. A further security patch rolled out for Windows 7 and later on 8 May 2018 has disabled this workaround. This is what is meant with "security updates to HTML Help" in KB4103718 and KB4103721. The security update may also prevent you from opening CHM files that you downloaded from the Internet, even if you saved them to your local hard disk. 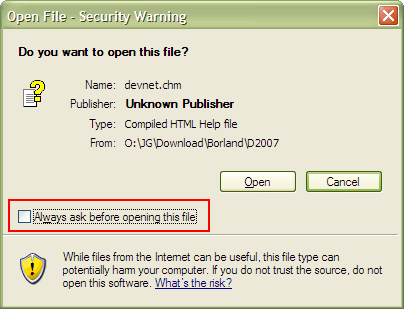 To resolve this problem, clear the "Always ask before opening this file" check box in the Open File-Security Warning dialog box, and then click Open. If you click Open without clearing the checkbox, the help file's table of contents will appear, but the body text will not. Alternatively, in Windows Explorer, right-click the file that you want to open, click Properties, and then click Unblock. See http://support.microsoft.com/kb/902225/ for more information. 2. Make sure your software's installer installs CHM files locally rather than on the network. Then they will always work. 3. Use the WinHelp format instead of HTML Help (CHM). You can make this choice in Project Options in HelpScribble. WinHelp HLP files are not affected by this security issue. WinHelp files work out of the box on Windows 95, 98, ME, NT4, 2000, and XP. On Windows Vista, 7, 8, and 8.1, the WinHelp viewer is a separate download. Windows 10 does not support WinHelp.